The contradiction series originally started as an exploration into creating a visual opposition to our perception of certain materials. As it evolved, it developed into an expression of psychological themes; the bronze slabs or ribbons have become imbued with emotions and direction taking on an almost anthropomorphic quality. Each bronze is cast by me in my studio using both lost wax and sand-casting techniques. 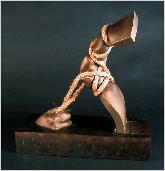 The sculptures in this series are unique creations, not limited runs - the master being destroyed in the casting process.